Designed as a low-cost alternative to the full featured SCORPION® 2 Data Logger it is intended for the customer who wants to measure temperature only. 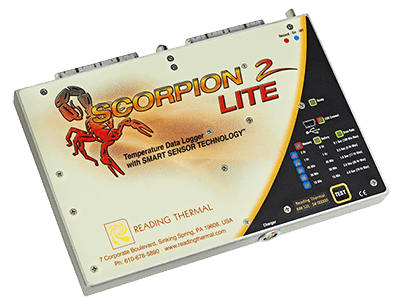 SCORPION® 2 LITE is compatible with a limited number of temperature measurement devices, i.e. Temperature Interface, Product Probe Interface, Magnetic Temperature Sensor Arrays, Product Probes and Bare Wire Thermocouples. It is also upgradable to the full featured SCORPION® 2 Data Logger. Allows ten external thermocouples to be connected to the SCORPION® 2 Data Logger. These thermocouples can be user supplied Type T with subminiature or standard male connectors. 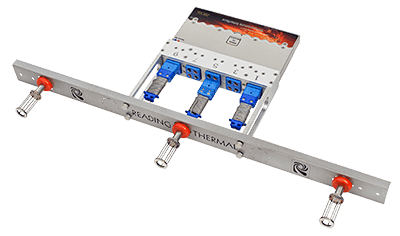 The Temperature Interface also serves as the mounting point for the Magnetic Temperature Sensor Arrays. Designed as a low-cost alternative to the conventional Temperature Sensor Array but still provides fixed sensor repeatability for bulk air temperature measurements. It mounts directly to the Temperature Interface device. Up to 10 Magnetic Base Air Temperature Sensors can be placed along a U channel array at user controlled locations. Tray Style Carrier for SCORPION® 2 Equipment provides easy loading and unloading on endless conveyors. The carrier, with SCORPION® 2, is inserted into the product flow replacing a bread or bun pan. Stainless Steel Magnetic Base Tray 406mm (16″) wide x 356mm (14″) long x 51mm (2″) high accommodates all SCORPION® 2 Equipment. 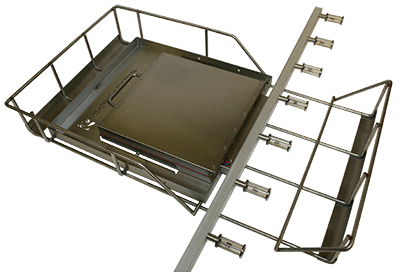 Basket Style Carrier for SCORPION® 2 Equipment provides easy loading and unloading on tray and grid conveyors. The carrier, with SCORPION® 2, is inserted into the product flow replacing a bread or bun pan. Stainless Steel Wire Frame Basket 381mm (15″) wide x 660mm (26″) long x 102mm (4″) high accommodates all SCORPION® 2 Equipment. 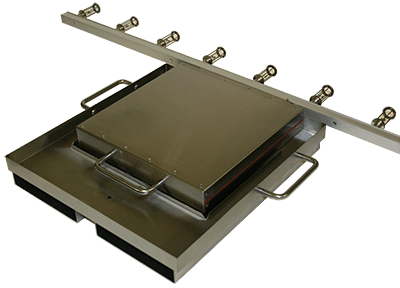 Designed to simultaneously profile temperature and airflow across the width of large tray and grid conveyor ovens. Array contains 9 Temp+Airflow sensors spaced evenly across the length of an aluminum bar. Actual bar length is 3.2m (10’6″) adequately covering popular oven conveyor widths from 3.5m (11’4″) to 4m (13’4″). This dual probe unit is placed under the bread or bun dough simultaneously capturing the pan/dough interface temperature and the dough core temperature. The copper spade is pressed against the pan, by the weight of the dough, measuring the critical pan/dough interface temperature. 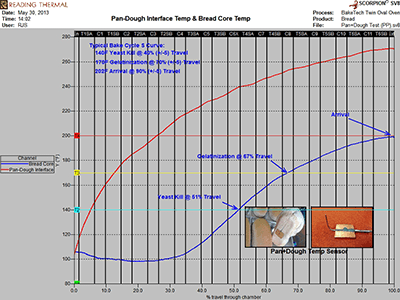 The vertical stainless steel probe penetrates the dough, to a fixed distance from the pan, measuring the dough core temperature used to produce the Bake Cycle S-Curve. The Pan+Dough Probe provides accurate repeatable results unattainable with hand-placed thermocouples. 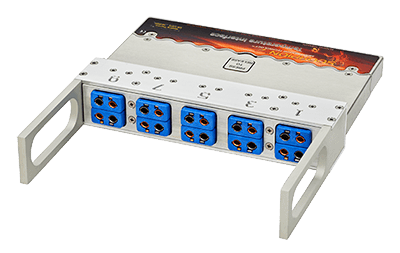 It connects to the Temperature Interface device which can accommodate 5 dual probes. 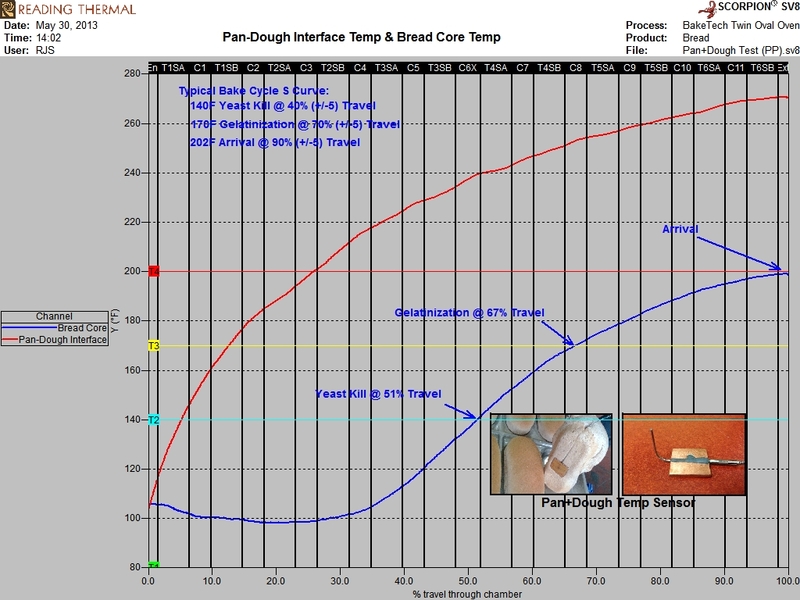 Bakers rely on Bake Cycle S-Curve Analysis to optimize the baking profile. This analysis provides critical insight needed to make adjustments to ingredients, bake time, and zone temperature settings. SCORPION® Software Version 8 (SV8) automatically calculates the three key S-Curve data points: Yeast Kill, Gelatinization and Arrival.